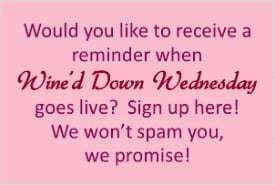 Welcome to the 13th Week of our Wine’d Down Wednesday link party!! We hope everyone had a great, fun, family and wine-filled Thanksgiving last week! I know we all enjoyed spending some much-needed time with our families. Thank you SO MUCH to everyone that has linked with us so far, we are beyond thrilled to have you coming back week after week and just love reading all of your posts! We were all so excited and overjoyed that so many of you want to come and share your awesomeness with us. Keep on sharing and spreading the Wine’d Down love 🙂 The fab four are back again and are excited to see what you have to share with us this week. Interested in joining our fun? Why not co-host with us! We are all booked up through December and are ready to start filling spots for 2014! What?? Yes, 2014 is almost here. Start it off right by getting a co-hosting spot with us- its free! 🙂 If you are interested, email Michelle at Michelle@ourthreepeas.com. We are so excited you have joined us for a girl’s night out, blog style! So…why Wine’d Down Wednesday? Well, what’s the best kind of party? The kind where wine is served of course! Since we can’t meet our fellow blog friends in person we thought we’d throw a party every week. So grab your wine, link up a recent post, and mingle. Your post doesn’t need to include wine, linking up while drinking wine is completely acceptable and encouraged! We want any of your funniest, heartfelt, absurd, crafty, or delicious posts. As an added bonus, we will also be rotating a different social media outlet each week so you’ll get minglers at all your hangouts. This week we are super excited to have Casey and Sarah from Real Suburbia as our co-hosts! These two blogging besties loves to blog about their adventures with their kiddos and their lives as they know it. Go check them out now! Come give them some wine’d down love and visit them on Facebook, twitter, Pinterest, Bloglovin‘ and instagram. Got your wine ready??? Not yet? Ok, we’ll wait…….Got it now? Great! Let’s get our links on!